06 Şubat 2019 Çarşamba 12:00 - 4 reads. The driver of the police car, the car a year ago, close to the Alexander square in the middle of the small of a young woman was hit, was apparently drunk. 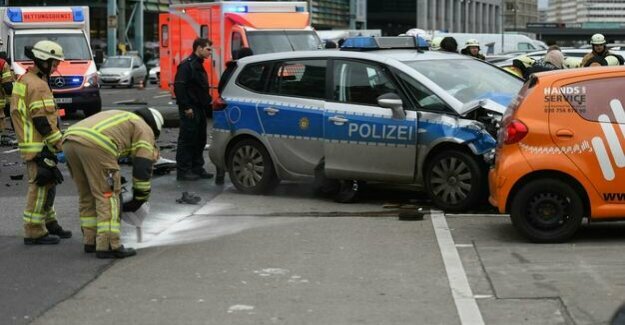 A report of the "Berliner Morgenpost", confirmed on Wednesday morning, the spokeswoman for the Berlin Prosecutor General's office Silke Becker. In the accident on the Gruner road, the 21-year-old Fabien Martini died as reported. "It is suspected that the driver was under the influence of alcohol during the accident," said state attorney's spokeswoman Becker. This knowledge could be from the patient documents of the driver can be derived, which gives the public Prosecutor's office. After the accident, the police officer had been treated in a hospital, where a blood-alcohol had been found with a value of about 1.0 per mil. Still was not, however, proven beyond a reasonable doubt that the officer was drunk already at the time of accident. In the "morning post" is from "anonymous Notes" that the driver was also drunk when the fatal accident happened. The police car should be driven at the Moment of impact, at least, Tempo 90, as it struck a year ago in the Renault by Fabien Martini. The accident happened on the left lane of the Gruner street diagonally behind the Red town hall, where on the median strip to Park cars. The 21-Year-old, the – statements to different stuff – just a - or ausparkte, was on a authorities tour, because two days later you wanted to open your coffee shop close to Checkpoint Charlie. She died at the scene. From the analyses of the data memory of the two involved in the accident the car is clear according to the "morning post" that the young woman wanted to Park on the median strip, as the radio patrol car in the driver's side of the Car raced. An analysis of the mobile phones also revealed that Fabien M. had not on the phone. The mobile phone, which had been in the footwell of the car found. Through this new knowledge is not determined against the driver of the police car only for negligent homicide, said Prosecutor's spokeswoman Becker. This also includes the suspicion of road traffic risk in consequence of drunkenness comes now. In what way is this a possible sentence changed, was not, however, predict a flat rate in advance, as a penalty depended always on the individual case. The parents of Fabien Martini feel, like recently in a daily mirror report reported by the state alone. An experience that also made members of other accident victims. "We are striving to ensure that the determination process for the relatives is unbearable, as quickly as possible," says attorney-spokesperson Becker. The driver of the police car, still no statement on the now known drunkenness. Now, the key is to verify the findings. What are the consequences of alcoholism of 1.0 parts per thousand, depends on the Person and the circumstances. To find possible consequences of information on various websites on the Internet. So extended as described on the page drugcom.de what happens from 0.8 parts per thousand: "a distinct lack of concentration, limitation of the field of view by 25 percent (tunnel vision), and decreased vision, reaction time by 30-50 per cent, euphoria, increased disinhibition, inflated self-esteem, balance disorders". The condition between 1 and 2 per thousand is disturbed, described as a "rush the stage", the consequences can be so summarized: "further deterioration of vision, spatial vision, increased disinhibition, and loss of critical ability, reaction ability, balance problems, confusion, speech disorders, orientation disorders".